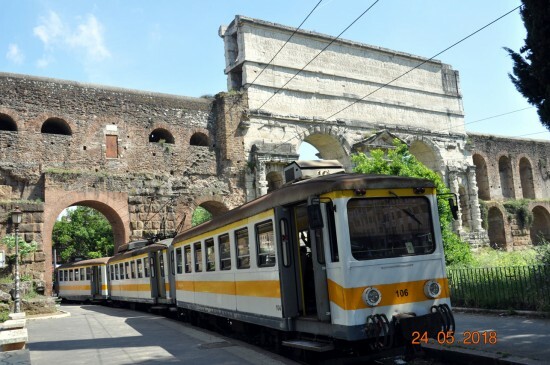 From this week we move to the Italian capital city of Rome featuring images of the Giradinetti Railway – which although not a traditional tramway as such is an on street narrow gauge light railway meriting its inclusion on these pages. The railway first opened in 1916 and although it has been severely curtailed in recent years it still runs for 3.4 miles between Laziali and Giardinetti. At one time it was part of the Rome-Fiuggi-Alatri-Frosinone railway but this is now the only section of that line that is still in existence. It has been planned that the final section would have been closed in 2016 but it has now been retained and modernisation is expected. In this view we see Stefer built 106 coming through the historic city walls at Porta Maggiore on 24th May 2018. Actually, the remaining route is longer than the 3.4 miles stated. Taking data from the Italian Wikipedia article about the line (https://it.wikipedia.org/wiki/Ferrovia_Roma-Fiuggi-Alatri-Frosinone) the distance between Laziali and Giardinetti is 8.63 km or 5.36 miles. The line was unfortunately cut-back to the depot at Centocelle in 2015. Giardinetti was the terminus from 2008 when the rest of the line to Pantano became a metro. Unfortunately, there are frequent accidents where it crosses the tramline at Porta Maggiore (usually the tram ignoring a signal I would guess).